Canadian frozen yogurt franchise takes globe by stormToronto, ON – Yogen Früz, the world leader of the frozen yogurt industry, is bringing customers more of what they want: self-serve frozen yogurt. The pre-eminent frozen yogurt company has rapidly expanded its Ü-Serve option (pay-by-weight, self-serve) into nearly 20 new countries over the last year, including Aruba, Brunei, Curacao, Greece, India (South and East), Lebanon, Malaysia, Peru, Poland, Qatar, Saudi Arabia, Switzerland, Saint Marten, Trinidad, Tobago, United Arab Emirates, Uruguay and Venezuela. Here in Canada, Yogen Früz has eight Ü-Serve locations and will convert 17 more by end of this year. The new stores offer both the original We-Serve (custom, mix-it-for-you blend of frozen yogurt, fruits and toppings) and the new Ü-Serve formats together, giving customers the best of both worlds. Twenty-six years after a modest beginning as a Toronto frozen yogurt shop, Yogen Früz today has more than 1,300 stores in more than 40 countries worldwide – more than any other frozen yogurt franchise in the world. “When I founded Yogen Früz with my brother, Michael, more than 25 years ago, we never imagined it would grow into the global phenomenon it has become. It’s an incredible feeling to know our smiling “Ü” icon has become synonymous with the happiness it brings to our customers all around the world. We’re fortunate to have such dedicated customers and thank each and every Yogen Früz customer out there for their continued business,” said Aaron Serruya, president and CEO of Yogen Früz. To launch its Malaysia location, located in the prestigious Petronas Twin Towers in Kuala Lumpur, the architectural icon of Malaysia, the company took an original and interactive approach to opening its doors to the public; view the time-lapse video here: Yogen Früz Malaysia launch. Yogen Früz cups are carefully positioned over the divider hiding the construction of the new store from plain view. One uncovered section reads “Yogen Früz opens when all the cups are gone.” The bottom of the cups read “Bring the cup back on Nov. 28, from 12 p.m. to 8 p.m. and get 50% off.” The promotion was a resounding success. The brand continues to expand and cater to a loyal customer base around the world, employing a modern aesthetic and an ever-changing repertoire of flavours and toppings. Now, customers can enjoy the new Raspberry Chocolate Truffle Mix-It flavour; decadent and delicious, it is available just in time for Valentine’s Day. 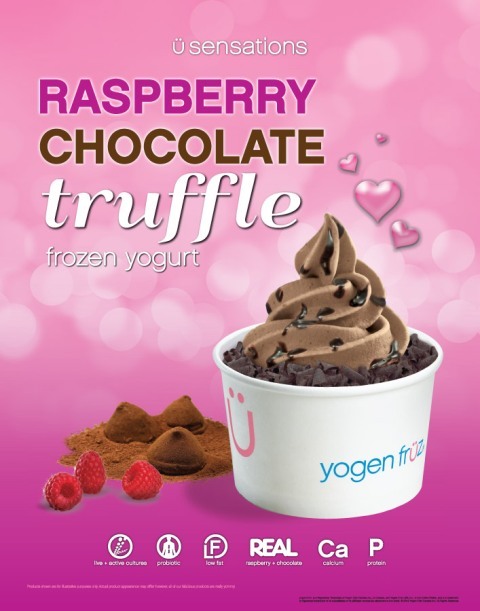 As a healthy lifestyle alternative to fast food since opening their doors in 1986, Yogen Früz frozen yogurt is packed with probiotics, and offers fat-free, low-fat and no-sugar-added frozen yogurt options, keeping right on trend with consumers’ healthier lifestyles. In 1986, two young brothers opened a revolutionary frozen yogurt retail concept in Toronto, Canada, providing consumers with an extraordinary product unlike anything they had tasted before. Today, Yogen Früz is a world leader in the frozen yogurt category, with more than 1,300 locations operating in over 40 countries around the world. Yogen Früz has consistently been recognized as one of the Top 100 Global Franchises for over 20 years. For store locations, please visit http://www.yogenfruz.com/storelocator/.